Rick Valentine has helped the ashes of more than a dozen people find their way to their families. Rick Valentine doesn’t do it for the notoriety. Nor the gratitude from families or the warm fuzzy feelings that can follow. He does it because he believes it to be a duty. For the past seven or eight years, the retired Rosauers employee has sat behind a computer, laboriously creating and updating hundreds of pages on Findagrave.com — a volunteer-led website that catalogs cemetery records across the nation. It’s like a Facebook for people looking for information about the deceased, complete with photos of headstones and obituaries, if they exist. But then there are those who don’t belong to a database. Those lost to time, unclaimed and unremembered. It was three years ago that routine research introduced Valentine to more than 800 unclaimed remains sitting in a vault at Fairmount Memorial Park in northwest Spokane, adjacent to Joe Albi Stadium; and to the phrase: “unclaimed and in storage.” In all his years of genealogical practice, he’d never considered that so many remains could be completely forgotten. “That blew my mind,” he said, seated at his dining-room table one spring morning. Now, he not only helps families reconnect with those already buried, but also with those who never were interred. Since taking that list of remains and uploading them online, he’s helped the ashes of more than a dozen people find their way home, including a local family who reconnected after a deadly house fire in the 1950s. But it’s the remains of military members that give him the most pride when they’re laid to rest, he said. And in less than a month, he’ll be celebrating another reunification milestone. 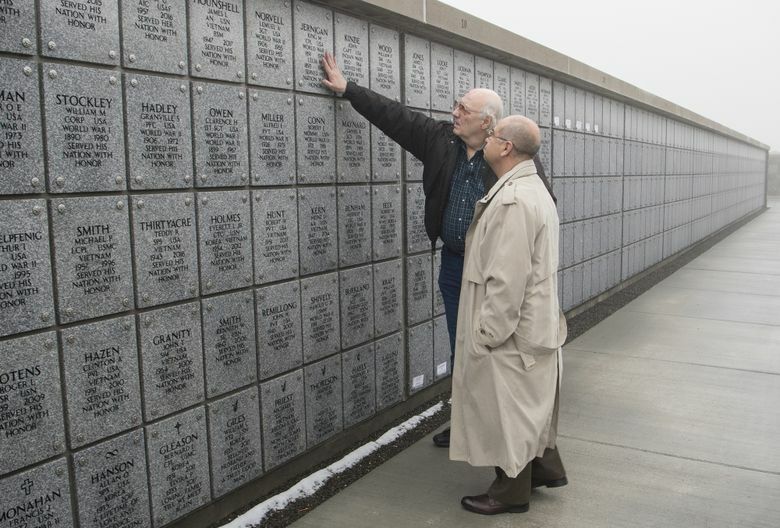 On April 19, the ashes of more than 20 veterans he found and researched will be given a proper military burial at the Washington State Veterans Cemetery in Medical Lake, complete with a 21-gun salute and the folding of the flag. How he came to be Spokane’s finder of the dead is a story more than 40 years in the making, since he helped his mother with genealogy back in the 1970s. It’s also a tale with an unlikely family reunion. 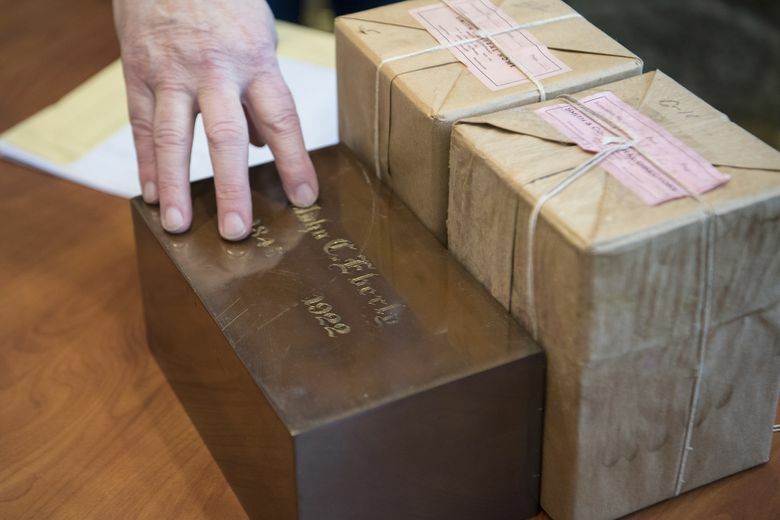 For 96 years, the packed ashes of a Civil War vet have been collecting dust, seemingly alone. Turns out, they were sitting only yards away from the ashes of his wife and son, both in the same vault. The story starts with Lemuel Norvell. Around Christmas 2016, Carol Wilcox, of Lenora, North Carolina, was adding names of family members to the World War II Memorial online registry. Before long, proof of their service would be etched into bronze and granite in Washington, D.C. Her uncle, Everett Wilcox, was a member of the 354th Pioneer Mustang fighter group, under the command of Brig. Gen. Elwood R. “Pete” Quesada. They were the first group to take the Rolls-Royce Merlin P-51B Mustang into combat from September 1943 to April 1945. Wilcox remembers hearing stories from her uncle, but not many. She’d ask when she could. While visiting with her uncle one day, she was given a list of names of people who served in his battalion. On that list was a man named Lemuel Norvell. But unlike the others, she couldn’t verify who he was. So she searched his name on Findagrave, and came across a page created by Valentine. “Unclaimed and in storage,” it read, linking to information that his ashes were in Spokane. She sent him an email, and within hours, got a reply. For Valentine, finding Norvell was the first time he’d considered that some on his list could be former military. Thinking there could be more, he did what he could to parse them out. First, by cutting the list down to those whose birthdays were about 20 years before a major war. Then, gathering as much information as possible and forwarding it to the U.S. Department of Veteran’s Affairs, where they could check if the person had military records. In most cases, there’s not enough information to go on: a first and last name left on a tag stuck to a box. Oftentimes, no middle name or date of birth. Before standards in record keeping, the names on death records were often spelled by the next of kin, errors and all. Altogether, Valentine was able to get a match on 13 sets of ashes. Norvell and the other dozen were interred on Oct. 13. Then, on to the next batch. “If we could get Lemuel Norvell laid to rest, maybe we could get them all laid to rest,” Valentine said. John Cecil Eberly was a dentist. He was also a Union soldier from Pennsylvania. By Sue Tanner’s account, nobody had paid much attention to his name until she came across it in a library book. Like Valentine, Tanner spends much of her free time updating pages on Findagrave. 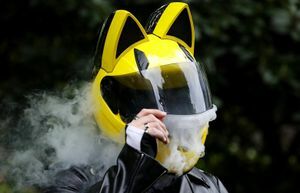 She also takes photographs of headstones at Spokane’s Greenwood Memorial Terrace Cemetery, and uploads them so families can visit their loved ones in cyberspace. It was during her trip to the downtown library’s genealogy department — where she’s a frequent visitor — that she found it: a drab, green book with no words on the cover. The words “Cemetery records of deceased war veterans,” on the spine. Thinking she hit the genealogical jackpot, she started taking photos of the pages. And on page 19, there he was. Once home, she sat down and typed each name into Findagrave. If it had a page, she’d update it with military information, and if not, she’d create one herself. When she got to Eberly’s, those pesky words came up. Again. “Unclaimed and in storage,” it read. And that name: Rick Valentine. John Eberly was born in 1848 in Montgomery, Pennsylvania, to Henry and Ann Eberly, according to U.S. Census records. By 1870, he had moved to Blair, Pennsylvania, and was studying to become a dentist. This would have been after he served in the Civil War as a young man in his late teens. By 1888, John had moved to Walla Walla with his wife, Martha Eberly, and had a son named Austin Dickinson Eberly, who was born on June 30 of that year, according to a World War II draft registration card. Around 1910, the family moved to Spokane, where John and Martha were employed in Hillyard, while Austin worked as a “chauffeur” and lived on the South Hill on Eighth Avenue, according to a 1910 Spokane City Directory. On Aug. 10, 1910, Austin married Lee Evans in Kootenai County. By 1920, they were divorced. Two years later, John passed away. According to an address listings, around this time, Martha and Austin were living together at 903 E. 10th Ave. in the South Perry district. 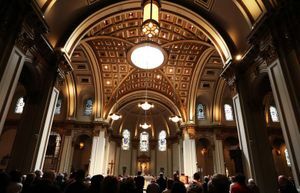 For some reason, John’s ashes were never claimed, despite the family paying a pretty penny to have his remains stored in an expensive and heavy bronze receptacle — much fancier than the standard boxes covered in brown paper and wrapped in string. The “A.D. Eberly” referred to in Tanner’s book was his son, Austin. In 1943 and at the age of 81, Martha passed away. Her ashes, too, were unclaimed. In 1959, Austin was the last to go. His ashes, like his mother’s and father’s, went unclaimed. Since they died so far apart, they were all stored separately in Fairmount’s vault. Until Tanner and Valentine came along. “Who would have guessed that a war that ended 160 years ago, that they’d still not be laid to rest?” Valentine said. As luck would have it, Austin had a military record of his own, allowing him to have a proper military burial like his mother and father. He served in World War I. Sitting at his dining-room table, Valentine can’t quite put into words why the work he does means so much to him. He settles for the easy answer — “the satisfaction of getting 40 veterans laid to rest. No other motive” — but he suspects there’s more to it. After the ceremony in April, there’s still a few more names to check and double check on his list. There’s also a few pending, but with government work being government work, there’s a possibility those ashes won’t be approved in time for the military burial. After that, it’s on to the next set of unclaimed remains. Perhaps another cemetery in town with a vault of ashes — after all, the 824 were from Fairmount alone. “Sue has been interested in looking at ashes at Greenwood,” Valentine said with a smile, referring to a cemetery in west Spokane.